But I believe the longer Instagram message that went along with it needs a full doctoral thesis to parse the subtext… since I am currently working on my M.A. (Masters of Archieology), I will give it a go. 1. He said “took” not “I gave away” or “I decided to share” but they “took” … I’m picturing two guys in balaclavas trying on a bajillion scarves and skinny jeans. 2. “Just about all of my clothes” — not just a T-shirt here or a Ford Day jacket there, but JUST ABOUT ALL OF MY CLOTHES!!! What the heck did they think he was going to wear when he got home, more suits and ties? 3. “while I was gone” — I imagine it went something like this? 4. “(I let them)” — added only so none of us would call the police for him. 5. “I have run out of stuff to wear” — aha, the mystery of Belt-Gate is solved! 6. “Luckily” — as if this magic suitcase appeared out of nowhere full of emergency items for Mr. Wardrobe-challenged. 7. “There was a suitcase of things from the Philippines” — once again, Philippines and Josh Bradley to the rescue! 8. “Like these Bench shoes” — that will work really well come winter. 9 & 10 “Thanks @kariontour for keeping the suitcase safe! — why do I picture Kari holding a fiery torch in one hand and a machete in the other, arms outstretched defending the little suitcase against a pack of wolves. Or a bomb going off and Kari flinging her body over the suitcase so not one cute polo shirt got singed! Or a tornado whirling through Apopka and Kari flinging the suitcase down the root cellar, jumping in with it and slamming the trap door shut just in time! Or maybe just dusting it now and then. 12. “guess I’ll have to stop being stubborn” — what, you, David, stubborn? Had no idea. 13. “Buy more clothes eventually though” — steer clear of men’s capris. 14. I’m glad I’m not the only one who takes pictures of my shoes! So now we have a barely-there-hair morning person who likes watching sports, being a sassypants and live tweeting? WHAT DID YOU DO WITH OUR D’ARCH??!!! It's nice to get a song done before noon. I feel refreshed. Thank you @Dustinonline and @stephaniemabey for being morning people. 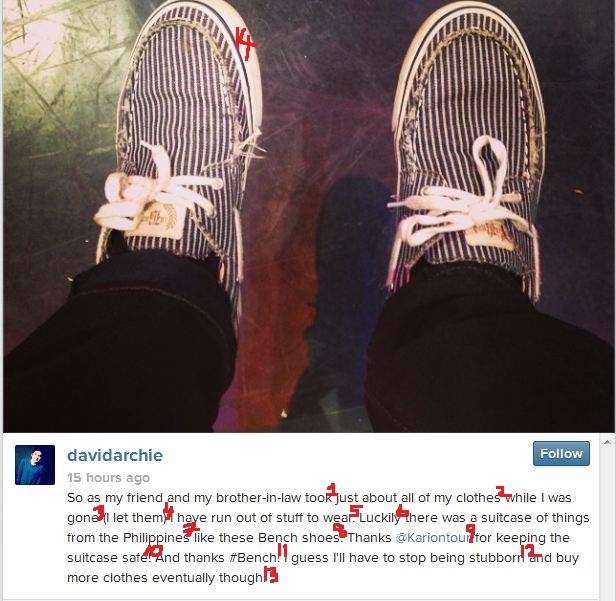 This entry was posted in Utter nonsense and tagged David Archuleta puts one foot in front of the other. Bookmark the permalink. TOfan, when you mentioned “Men’s Capris”, it reminded me of the first image I had when I read David’s friend and brother-in-law had taken the clothes. I’ve not studied the height of his b-i-law or whatever friend, but I pictured two fellows in short David jeans looking as though they were in capris! This is not a unique situation. Oldest got home from his mission to discover many of his things gone. And he has sisters. I don’t know why they would want his shorts, shoes, jeans and t-shirts, but…whatever. So when middle child (daughter) went on her mission, she had me hide her clothes and swear I wouldn’t tell her sisters where they were. OH they looked for them. I never had such sibling problems, but then my closest sibling was 7 years older than me and a brother. Thanks for this, you genius. ROFL, he definitely needs more clothes, well at least the elephant shirt got saved or the little clothes thieves didn’t want it. 😉 LOVE the breakdown! I’ll say it again Tofan… You are a genius!!!!! Oh I’m trying to keep up with your wonderful humour! This is hilarious, loved reading through all of it, lots of chuckles. Yep, pretty cool shoes though….although, no, come winter they may not fare so well, ha. I remember on Idol days, D said he used to like the shopping. Well, maybe not so much anymore, just may have go on a shopping spree though. Did anyone notice the bicep on the right arm holding the laptop in @stephaniemaybe’s tweet. Wowza. Where’d that come from. By the way, got a little distracted, loved the article. You get more out of a simple tweet than anyone I know. It was hilarious. I know I’m always going to laugh when I come to this site. You’re a real cheerer upper, if those are even words. Once again, my post is credited to Anon. I don’t know why it’s doing this. I have all the sign in blanks filled in. It should be Lynnella. Thanks for the funny reminders of days gone by! I especially love the Kari visuals. I also remember when he wished he could wear the same thing every day without having to think about it so I’m guessing he’s missing the designated wardrobe of the past two years. It’s been interesting to watch the things he’s dealt with as he’s come back to the regular world. More than would have occurred to me on my own. Loved your deconstruction of David’s tweets. I’ve been enjoying David’s tweets today. It seemed like a happy day for him in that he finished a song and Chile won. Loved the pictures too. Now we just need to hear a snippet of one of his new songs!